Debra's thoughts on Oracle: Rant - OPN and ADDM! I should have good statistics for this blog, it should appeal to many different communities, OPN or the Oracle Partner Network will spark the interest of one community I work in and ADDM or Automatic Database Diagnostic Monitor will have my technical friends thinking I have crossed to the other side. Oracle Product Names and Acronyms Drive Debra Mad! I'm an Oracle ACE Director, a software advocate and this isn't a direct moan just at Oracle, everyone does it but they are a great example. We all suffer from acronyms over use, and as someone who presents regularly I have to constantly remember not to use too many. A quick google on the overuse brings back many studies of the problems this can cause. I teach a course that I abbreviate to AYNTKAO - All You Need To Know About Oracle. It is aimed at people having their first Oracle project, not necessarily someone starting an Oracle career, it could be a very experienced change manager or project manager who has not been exposed to them before. I try very hard to avoid the TLA, although many products in Oracle have moved to four or five letters (isn't this a sign to someone, somewhere, there are too many?). You need to be careful, sometimes names are created to match the acronym. I have joked in the past I would like to meet the person responsible for creating the product names within Oracle, do they pick the names to match the acronym they will be known as? It would help if there was a single glossary, it would help. Tell me if I have missed one in my search. I can find them in some product documentation but very few people use one product in isolation. 1. 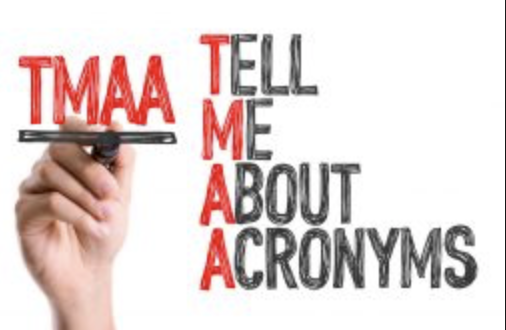 If there is an acronym use the right one! eg E Business Suite is EBS - not E-Biz or E Bus even wikipedia is confused. As I said we don't use products in isolation so this confuses people. I worked for the same company for 25 years. When I left because they had a company range of mobile numbers they re-used my number for someone else. Today almost 5 years later he still gets calls for me. How frustrating must that be? 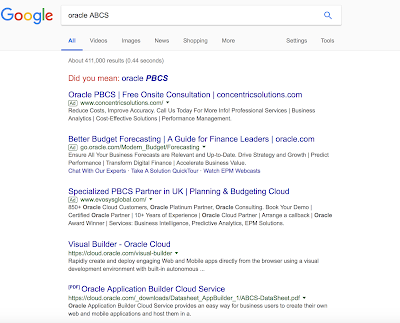 OCS is Oracle Cloud Services (the organisation that manages the cloud), but until very recently was Oracle Consulting Services, who have been renamed simply Oracle Consulting or OC. People are still using the old acronym and getting others confused. 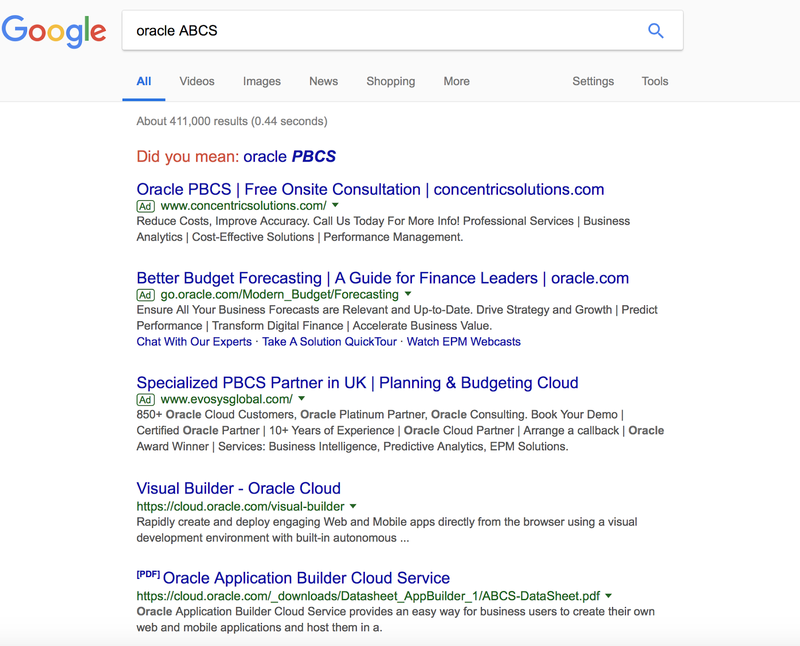 I loved the name ABCS it was a great acronym for a product aimed at citizen developers, and I wrote an Oracle Scene article in 2017 and a presentation I was very proud of; it had a great ring to it. Extending your Cloud HCM is as simple as ABCs. Until last week when Oracle launched ABCS Autonomous Blockchain Cloud Service. Don't get me wrong I think blockchain has a big future in my area and I was excited about the launch. Oh and what does Oracle ACE stand for? Not sure this is official but Awesome Community Expert has a great ring to it!